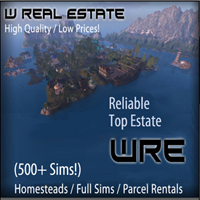 W Real Estate: Premier real estate, Katya Dirval is a special sponsor for Sim Street Journal, having the first position and supporting the publication from the beginning. 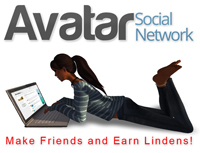 Her profile reveals the reasons for her company’s leadership status in Second Life®. Virtual real estate is the foundation for a SL lifestyle, mirroring the same function in real life, with the advantages of instant travel and perpetually sunny days. Anyone in need of land is wise to check first with W Real Estate. Ty Lome’s article on Snug Harbor inspires any virtual manager or developer. A visit to his properties on the Blake Sea demonstrates the best of SL lifestyle! Discover a comprehensive community of shops, venue, homes, docks, and even a museum! Not many sims offer such a great variety of features, while maintaining privacy of residents and freedom to sail! AP Products: A not-quick visit to Marketplace will demonstrate how expansive Arkad Products has become. There is little that Arkad Baxton has not attempted. He owns a mall as well, and is the founder of the Avatar Social Network. His other self, Uzo Dayafter, is a club owner, host, and DJ. Somehow the real person behind these two avatars accomplishes as much as two people! Profiled both for his “Arkad’s Axioms for Virtual Marketing” and as a renaissance man in “article,” he also is a good friend, mentor, and promoter of Sim Street Journal. 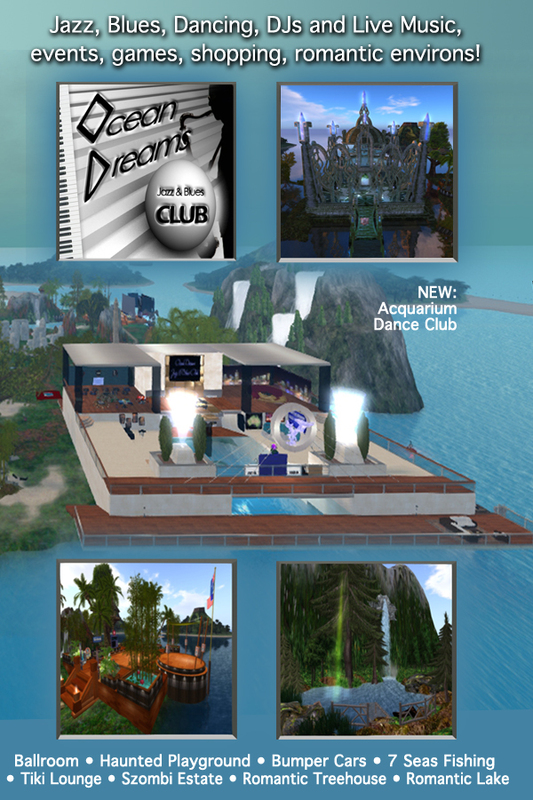 Ocean Dreams Jazz & Blues Club: Keep dreams alive and dance away your worries. A place to find great music and great company. With a beautiful romantic ballroom in the sky, a popular casual dance club, Greedy table, and a 7 Seas Fishing area, the activities appeal to most everyone. Or just come and relax at the charming tree house or resort lake. There are also some great vendors for some casual shopping. Don’t miss the monthly raffle for 500L. Six years in SL! Last of Humanity is a procedurally-generated F2P MMO FPS that brings elements and interactions from modern day society into an immersive game. The mechanics aren’t new, but this unique mixture is rewriting the rule book. During the development, the potential fan-base exploded with enthusiasm—inspiring momentum. With 15,000 gamers waiting to play, they are on the verge of release. Leaping into the beta version, those first willing to journey into this dangerous after-the-Apocalypse environment. world will have great advantages. OMG!, Inc, Fashions: Kaddan Yue, owner and designer of OMG!, has experienced every aspect of the retail fashion business in SL. Riding the roller coaster from the very early days, she adapts and recreates her approaches, while being true to her own creativity, while also satisfying the customer. That balance gets sharper with each collection. Her newest designs are the most sophisticated and flexible yet, with a shop easy to navigate. G&T Fashions by Greenie Lane comprise the elegant and the classic wardrobe additions for the sophisticated. Having advertised with Sim Street Journal publishers for a long time, to represent a shop that well fits a readership of artists, musicians, enterpreneurs, explorers, and those who are serious about discovering what the virtual world has to offer, dressing is the most self-expressive part of the experience. Paris Obscur: Moody and provocative, Paris’ sultry voice and humor charm his growing fans. Though he may appear austere in his fascination with black and songs of depth and longing, he envelopes listeners with a warmth powered by his personality. Presenting a range of emotions in his repertoire, he brings the same intensity to a range of songs and styles. Catch him in the afternoons via European time. 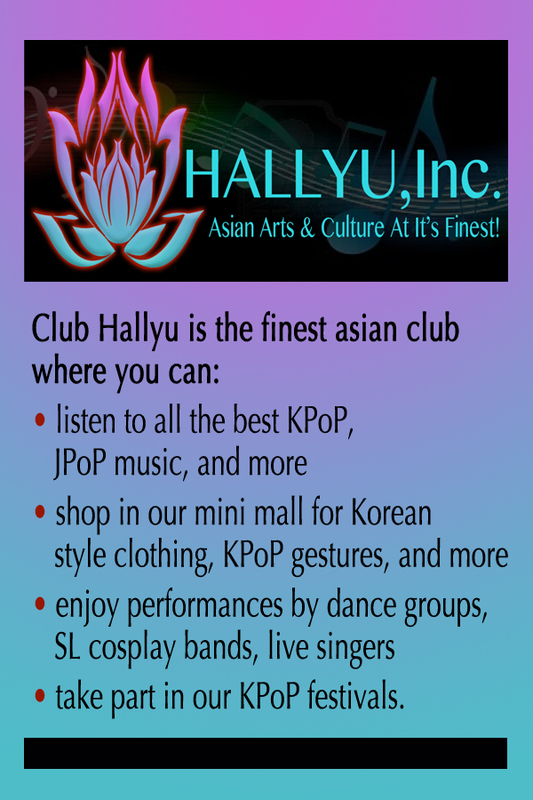 Club Hallyu is the finest asian club to hear the best KPoP, JPoP music, and more. Special performances of dance groups and live singers provide great variety. Additionally there are festivals, rides, and activities. It is a place where everyone is treated like friends and family. The mall has great selections of Korean style clothing, KPoP gestures, and more. Hallyu also has an online store with products that fit the theme of the club. Eclectica: Virtual jewelry has similar parameters to real jewelry design and can be just as challenging to build. As a virtuoso in using the SL as a creative medium, Tiffy Vella’s talents shine in her store. With both classic and innovative designs, she also has expanded to accessories such as hats, scarves, shoes, and whatever takes her fancy. Her store, Electica, is truly eclectic. Music Not Politics: (Throughthesewalls Moody) Tara represents some of the top musicians performing virtually. With many years of experience on the grid, she writes a regular column for Sim Street Journal that explores the business side of the industry. As she develops new ways to promote and sponsor events, she compiles the lessons learned into an engaging and thoughtful exploration of the medium’s potential. Guthrie’s: One of the oldest, and certainly the best known folk club on the grid, Guthrie’s is a legend. Based on the real life Guthrie’s Foundation, the walls are filled with the classic heros of this gracefully transferable music genre. Perfect for the SL environment, the romance of the original singer/songwriter is reignited in this international stage. Guthrie’s showcases new and well known talents. ENT SL Radio: One of the fastest growing radio stations in SL, airing 44 shows a week, ENT SL Radio hosts live performers, DJ’s, talk shows, and infotainment. A wide variety that has something for everyone, listen for Jazz, hip hop, classic rock. A partnership with a Second Life based radio station extends communication into another media, albeit one very different than publishing. However, the talk shows, and opportunities to integrate with video blurs the boundaries between traditional media. The convenience is unparalleled, and flexible as this new station gets off the ground with innovative programming.